There's something bananas, mushrooms, wine and cruise ships have in common. They all use precise heating, ventilation and air conditioning/refrigeration (HVAC&R) controls to keep the temperatures spot on to prevent quick ripening, increase yield, correctly process and create the perfect comfort level for the environment, respectively. The systems that control these spaces are often complex, leaving business owners repetitively paying more to the systems' companies to work on and show them how to use the systems properly. Therefore, teaching local HVAC&R professionals how to use company specific controls is not something most companies with Direct Digital Control Systems, and other similar products, like to do. "There are so few people wanting to teach controls. Everyone is keeping it quiet like it's a secret, where as we've taken the opposite step. If someone can teach controls and get it out there, it's OK," says Stephen Miranda, CEO of Innotech Controls based out of Brisbane, Australia. Wisconsin Indianhead Technical College instructor Frank Vidas reached out to Miranda to bring his HVAC&R program to the next level and open more doors for students. This is the first technical college in the United States where Innotech is involved," says Vidas. "For us as a college, it's tough to gain this type of insight without paying a fortune for it. "This is a bit of Innotech giving back to the wider community," says Stephen Miranda, the CEO of Innotech Controls. "The thing that we do is not only deliver a training course, we also give the colleges a collection of new equipment to train with, current software and back-up and a trainer forum that they can subscribe to." The comprehensive and accredited course was developed by Innotech in conjunction with several national and international institutes. 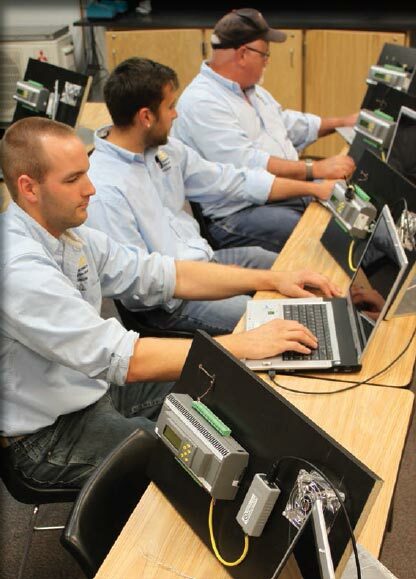 It includes Direct Digital Controls terminology, basic theory, programming, commissioning and fault finding. "Equipment wise, just the controls alone are $10,000," says Innotech System Trainer Walter Colaiaco. "It's also very simple, right up to hands-on programming. I've built assessments too. We can customise the course to suit." While the new equipment is now ready for this semester, second year students this past spring already took part in the first ever eight-week HVAC&R and BMS Controls course at WITC. 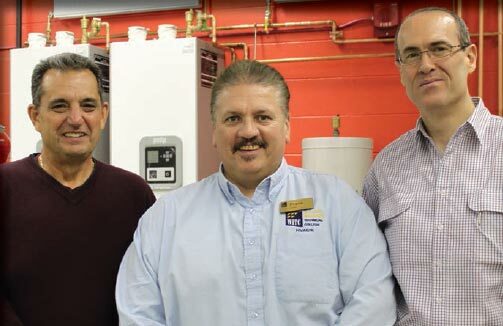 Pictured from left: CEO of Innotech Controls Stephen Miranda, WITC HVAC&R Instructor Frank Vidas and Innotech System Trainer Walter Colaiaco. The course teaches students a fundamental understanding of control processes and application of Direct Digital Control in the HVAC&R sector, giving them the foundation to enter the field of Building Management System (BMS) controls, servicing and engineering. Vidas and both Innotech leaders agree there needs to be more people trained in controls, as there is currently a skills gap and companies have been searching competitively for employees. "We have a distributor in the U.S. and 20 dealers across the country." says Miranda. "One of the things that WITC is about is putting people into jobs. We've been there 30 years and we still have a problem getting staff. We have a two-year program to get our employees up to standard to let them loose. You train people and then they get offered $5 more and then they leave." "The biggest thing we see is a lack of skills, a lack of training. We try to partner with institutions like WITC and teach them just the basics of the controls and to try to help them further their careers," says Colaiaco. With the donated training and modern equipment, students will be a step ahead when they leave WITC. When you look at it, it's almost too good to be true, but this is one of those scenarios where it is good and it is true," says Vidas. For more information about the Heating, Ventilation, and Air Conditioning/ Refrigeration (HVAC&R) training courses, visit the WITC website.